While I know that reading the newspaper — with high unemployment, record budget deficits, and drastic spending cuts — might make you want to go back to bed in the morning, from my experience there is plenty of positive excitement happening in Silicon Valley right now. Venture capital (VC) is the engine of Silicon Valley, VC investment is strong, and entrepreneurship seems to be alive and well. After finishing up a six-year run at my last company, I am currently in the process of looking for my next opportunity. Since I’ve been out-and-about and thinking quite a bit about the job search process, I thought I’d share a few of my learnings along the way. Opportunity trumps execution. Seek companies that face large and/or obvious market opportunities. I have always done best when joining companies where I am convinced that everybody needs one. Team trumps position. Being on the right team is more important than the particular position you’re asked to play. Positions change over time. Don’t pick a director title at a weaker company when you could have made five times the money, had five times the fun, and made five times more valuable networking relationships as a senior product manager at a stronger one. 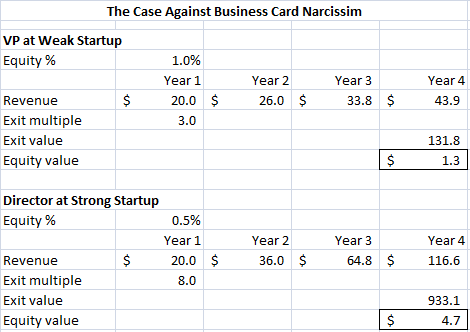 Business card narcissism can be a road to nowhere. See the bottom of this post for some fun math in this regard. Know thyself. Get a sense for what kind of environment you will realistically like and then use interviews to validate or invalidate that view. For example, I’ve talked to companies ranging from 3 to 300,000 employees, and I can say that I most enjoy the 100 to 10,000 range. Yes, that’s two orders of magnitude, but I’ve talked across five! Have a positioning. I have worked hard to keep my positioning “strategic marketing guy.” You might think I would have dumped “marketing guy” in favor of “CEO” during the past 6 years, but I deliberately did not for two reasons: I thought it would needlessly close doors for SVP/ GM jobs at larger organizations and I thought it was inaccurate. In the end, nobody grows up a CEO; we all grow up in some function that helps define who we are. Yes, I have been a successful CEO, think I’m process-oriented, and think I’m great at running and scaling operations — but deep down I’m an analytical, strategic marketing guy from New York. It’s essence vs. experience: positioning is about essence. Remember that like sales, it’s a volume game. I have looked at over 40 different opportunities in one month and keep finding new ones every day. I’ve done this through networking with peers and venture capitalists, cultivating recruiter relationships over the years, and to a lesser extent by leveraging social media. At some point you will pick a new role and you will make a more informed choice if you have really beaten the bushes while searching. Be picky. Life’s too short and we spend too much time at work to work with people we don’t genuinely enjoy. For me, that means finding smart, direct people who are just a little bit crazy. For you, it probably means something else. But all of us should (politely) avoid bossholes (or boardholes) who ruin things for everyone. Be nice. A CEO friend has a board member who is fond of saying “friends come and go; enemies accumulate.” That’s great advice to remember both in day-to-day work life as well as when you’re out looking for a new opportunity. It’s a small valley and you want to accumulate as few enemies as possible during your time working in it. 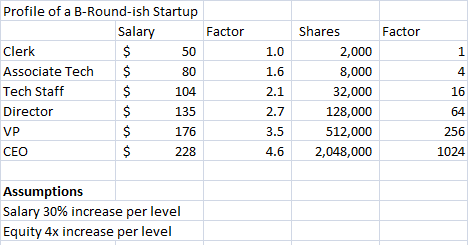 First, let me make a table that demonstrates two rules of thumb: salary increases 30% with each level in an organization and equity increases 4x. Applying these two rules generates a reasonable approximation of a B-round startup, below. Note that while the CEO makes 4.6 times a clerk’s salary, he or she makes 1024 times a clerk’s equity. That is the argument for being high in an organization. But we have to be careful not to apply that logic blindly. Let’s take an example. Say you’re good enough to get a VP job at a good quality startup. That might come with 1% equity grant. Now, let’s say you’re talking to another, better-quality startup and they want to make you a director with a 0.3% equity grant — but, because you’re a hot candidate you can talk them up to 0.5%. Let’s say the stronger company is growing 80% and the weaker one 30%. You make 3.5 times as much money with the smaller grant, and smaller title, at the stronger startup. Note that even if you can’t talk up the grant to 0.5% and only get the 0.3% initially offered, you still make over twice the money at the stronger company. Which company will look better on your resume in the future? And, if you’re good, who’s to say you won’t end up a VP at the stronger company in year two? Hopefully this demonstrates how company opportunity trumps job title — i..e, that being on the right team is more important than the position you’re initially asked to play. Excellent post – completely agree. Having just gone through a similar process, I came to many of the same conclusions. Where before I was very focused on pre-IPO and the right title, I chose a post-IPO (but still “IPO zone” as you defined it) very hot company (QlikTech) with a huge opportunity, on a great team. And six months in, I wish I had figured out these lessons earlier in my career! Thanks for your comment and glad to hear you are happy … and the IPO zone formula works! Great article. I am definitely saving this piece for review after my current gig spins down. I only have one data point for joining a tech firm in the “IPO Zone”, but I must say that it seems like the author nailed it. You brought us insights even between jobs. I in particular agree with your positioning line — what is the core of yourself and what you enjoy most and doing the best. The salary and option table are enlightening too.. Very interesting way of motivating people. It is really different from Italy and it is one of the many reasons why VC don’t work in Italy despite of the brilliant people and their ideas!! Great post and thanks for sharing. I’d love to post this on my blog as a resource if you don’t mind. Happy to attribute it to you.